What does one do with over ripe bananas which nobody eats? The last two in my fruit basket were looking rather blackened and sad! 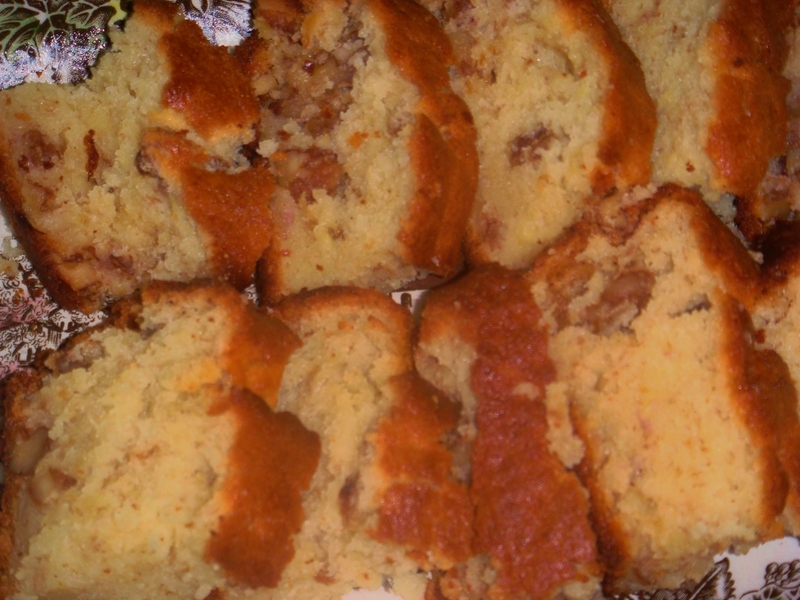 I had only last week eaten the delicious banana bread made by my friend Charu. I quickly called her up to get the recipe. Her secret ingredient was sour cream which made the bread so moist and soft. My children loved it and my overripe bananas did not have to be thrown! 1. Preheat oven to 350 degrees. Butter a 9-by-5-by-3-inch loaf pan and keep aside. 2. With electric beater cream butter and sugar until light and fluffy. Add eggs, and beat to incorporate. 3. In a medium bowl, whisk together flour, baking soda, and salt. Add to the butter mixture, and mix until just combined. 4. Add bananas, sour cream, and vanilla; mix to combine. Stir in nuts, and pour into prepared pan. 5. Bake at 350 degrees for about an hour or till the cake is done.